The scientific program is now live. The abstract title is limited to 300 characters and the abstract text is limited to 2000 characters; the 2000 character limit includes spacing, punctuation and LaTeX. Following the abstract deadline, submitted abstracts may be moved to another appropriate session. Final decisions regarding placement of individual abstracts and sessions rests with the Program Committee. There is no limit to the number of contributed abstracts a First Author can submit. First authors are limited to one invited abstract. 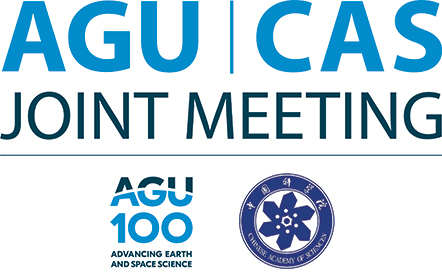 Membership in AGU or CGU is NOT required in order to submit an abstract. A flat fee of $75 (USD) will be charged for each regular submission. A flat fee of $45 (USD) will be charged for each student submission. The only method of payment accepted for abstract fees is by credit card (Visa, MasterCard or American Express). The abstract submission fee does not register you for the meeting. Separate registration fees apply. Registration will be open May 2018. If you prefer a poster presentation you may request one. These requests will be honored by the Program Committee. Oral and poster presenters will have the opportunity to upload their ePoster on the AJM2018 Meeting ePoster site prior to the meeting; details about how to upload ePosters will be distributed to poster presenters in late June 2018. Oral presentations are not guaranteed. Oral sessions are allocated by the Program Committee based on the total number of submissions received to a session, and oral presentations are assigned by the Session Conveners. Submission of an abstract carries with it the obligation to give a presentation in the designated manner assigned. It also grants the society organizers permission to publish the abstract in the meeting program. Once assigned by the Program Committee and scheduled by the session convener, the date and time of the presentation will not be changed; presenters are advised not to arrange travel until acceptance notification is issued in late June with assigned session dates and times. The presentations may be scheduled during abstract sessions 17-20 October 2018. Invited Authors will receive an invitation from the session convener sent from the submission site. The invitation will include a link to submit directly to the session; invited authors must submit the abstract via the link included in the invitation. If the abstract is not submitted through the formal invitation, the abstract will not have an invited status listing. A person may accept one invitation to submit one invited abstract. Session conveners will not be allowed to present an invited talk in a session they are convening. However, conveners may submit a contributed abstract to a session they are convening. In early August, abstract acceptance notices will be sent and the Program will be made available.